At times albums can be so retro that they actually sound quite cutting edge. This is the case with Wyatt's Shleep. I am pretty sure that the reason for this is that it is going back to music that was never mainstream, to a kind of progressive experimentalism that is completely out of place in 1997. Bringing Eno in to the proceedings helps to make this album pretty great, it starts out with a track which is pretty close to Eno's solo career sound but it then develops into something else. Wyatt has a kind of experimental jazz sound which really does not detract from the more poppy elements of the music. So yeah I really liked this album, possibly because I miss listening to this kind of music, the last few years having been quite barren in what concerns this type of music. Basically I really liked this album because I miss the 70s, and this would sound pretty great any decade. 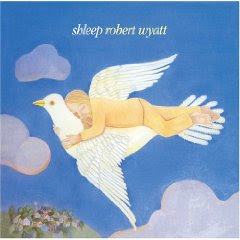 Shleep is the eighth album released, in 1997, by Canterbury Scene survivor and progressive rock legend Robert Wyatt.